See that black thing up in the corner? That’s Saturn, with its rings evident toward the top of the frame. And that tiny dot with the arrow pointing to it? 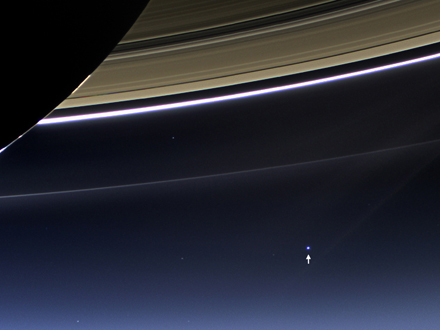 That’s Earth, as viewed from the Cassini space probe now heading out of our solar system. On that tiny dot is you, everyone you’ve ever known and everyone who’s ever lived or died – the entirety of the human race and everything we’ve built, destroyed, learned and chosen to ignore. About the same time this picture was taken (July 19), I was gazing back at Saturn with my son through a telescope in our suburban front yard. I felt incredibly small and insignificant. Seeing us as we look from space only magnified that feeling. But that feeling of being a speck of dust floating in a sunbeam is liberating, too. On a cosmic scale, the things we worry about wouldn’t stir the breeze on an alien planet. So, if you’re a bit peeved at your spouse or things didn’t go so well at work or you can’t get your head around that bit of writing you’re trying to hack out, remember this is what it looks like peering back at us from the edge of our little island of stability in this very dangerous universe. A universe that is much, much bigger than any of your problems.